The third video in a series on Restoring the Manalapan Brook is now available. 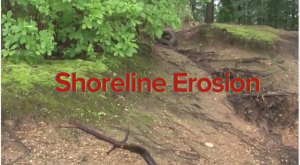 This video focuses on shoreline restoration along a lake or pond. Manalapan Lake in Middlesex County’s Thompson Park received an ecological makeover this past fall when 600 feet of bare shoreline were planted with native plants. Early this summer, volunteers came out to help expand the buffer with additional native plants. This shoreline buffer was established to prevent soil from eroding into the lake, improve habitat, soak up pollutants, and improve the beauty of the lake. Manalapan Lake is part of the Manalapan River Watershed which flows from Monmouth County north into Middlesex County eventually connecting with the South River and then emptying into the Raritan River. The project was conducted by the Freehold Soil Conservation District in partnership with Princeton Hydro and Middlesex County (including Rutgers Cooperative Extension, and Parks and Recreation). Funding was provided by the NJ Department of Environmental Protection 319(h) program. Additional videos in the series can be viewed here (the new shoreline restoration video will be posted here soon): https://freeholdsoil.org/conservation-projects/projects/. For more information, contact Michele Bakacs, Rutgers Cooperative Extension of Middlesex County, mbakacs@rutgers.edu or (732) 398-5274.